Susana Gómez Vázquez is an emerging pianist born in Alcalá de Henares (Spain) in 1995. After graduating with a First Class Degree in Bachelor of Music from the Royal Academy of Music, where she was a scholar student under Professor Hamish Milne, she is currently a Master Student at Conservatori del Liceu under Professor Josep Colom. She began her studies at Alcala de Henares Music Conservatory under Professor Miguel Angel Martinez Guillén. Afterwards, she studied with Professor Patsy Toh at the junior course of the Royal Academy of Music in London and at the Purcell School, composition under Simon Spears at the Purcell School and singing under Tom Marandola, and was awarded with scholarships from both institutions. Her pianistic interpretation has been enriched by private lessons and master classes from professors such as Fou Ts’ong, Cristina Ortiz,Tatiana Sarkissova, Julian Martin, Martino Tirimo, Yong-Hi Moon, Kenneth Weiss, Dimitri Alexiev, Mikhail Petukhov, Pascal Devoyon, Kathryn Stott, Menahem Pressler and Gabriela Montero. Since her debut in 2006 in the National Auditorium of Music of Madrid, she has performed regularly in different concert halls and festivals in Spain, England, Italy, France, Germany and Switzerland such as the Wigmore Hall, St Martin in The Fields, Colston Hall, St James Picadilly, Purcell Room (Southbank Centre), Teatro Calderón de Valladolid, Auditorio de Música de la Universidad de Alcalá de Henares, Leeds International Concert Season, Fazioli Concert Room, Sendesaal Bremen…amongst many others. She has been broadcasted in BBC Radio 3 and Radio Nacional Clásica. Always keen to discover new music, Susana has worked and commissioned new music from established composers and emerging composers. 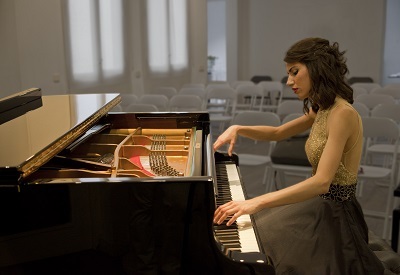 Susana Gómez Vázquez won first prize in different competitions including the 86th Concurso Permanente de Juventudes Musicales de España 2016, the International Piano Competition “Ciutat Carlet” (including prize for the best performace of Spanish music), the Royal Academy of Music Iris Dyer Piano Competition and the Madrid junior and senior Intercentros Hazen Piano Competitions. During her time at Purcell School she won the Freddy Morgan Competition, the Wigmore Competition (both solo and chamber) and was honoured to be awarded both the Senior Piano Prize as well as the Senior Composition Prize. She won second prize in the Cavatina Intercollegiate Chamber Music competition and the Isaacs and Pirani Piano Trio Prize. She was also awarded the Maud Hornsby Award and the Franz Reizenstein Prize at the Royal Academy of Music and was a laurate of the XXII Ibiza International Piano Competition. She has been selected by “Fundación Piumosso” to the take part in the concert series “El primer Auditorio” in the National Auditorium of Spain in 2018. In the area of composition, Susana’s pieces have been performed at the Wigmore hall, Royal Academy of Music, Amaryllis Fleming Concert Hall, Purcell school and other places all around England by professional musicians and orchestras such as the Milton Keynes orchestra and the Aurora orchestra. She won the first prize in the North London Festival of Music and Drama Senior Composition Competition and was Highly Commended in BBC Proms Inspire Young Composers Competition (junior category), resulting in broadcasts on BBC Radio 3 . She was awarded the first prize in Purcell School composition competition and her orchestral work was performed in Queen Elisabeth Hall. If you are interested in working with Susana, please get in touch with the EMCY Office. Susana Gómez Vázquez, ¿Quién es?